"Ganatra brings to her films a certain energy and creativity that mark the best indie features." Nisha’s acclaimed début feature, Chutney Popcorn with Jill Hennessy, won Audience Awards at the Berlin International Film Festival, Newport Film Festival, Paris International Film Festival and Madrid International Film Festival and Best Feature Film Awards at the Outfest Los Angeles and San Francisco Gay and Lesbian film festivals. Her sophomore feature, Cosmopolitan starring Carol Kane and Roshan Seth premiered at the South by Southwest Film Festival and was selected by Input as one of the top ten films shown on public television. It was the only narrative film chosen for this distinction. Nisha directed Cake with Heather Graham, Sandra Oh, Taye Diggs, Cheryl Hines, and Sarah Chalke for LIONSGATE Entertainment and First Look International Pictures. Nisha’s work for television includes the Real World New York and theRoad Rules/Real World Challenge for MTV and the movie FAST FOOD HIGH starring Alison Pill and she wrote the The Cheetah Girls: One World for Disney. She recently completed Beholder for the ITVS/PBS series FUTURESTATES, a modern day TWILIGHT ZONE series starring Jessica Pare (MadMen), Michael McMillian (True Blood), Rupak Ginn (Royal Pains), Michael Mosley (Scrubs) and Elaine Hendrix. 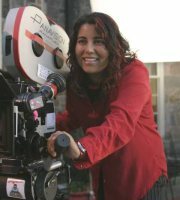 Nisha has also been presented with Women In Film’s Original Vision Award, the Max Factor Filmmaker Award and was selected as one of Filmmaker Magazine’s Indie Filmmakers to watch. Copyright © 2005-2012 Nisha Ganatra, MataFilms@aol.com. All rights reserved.